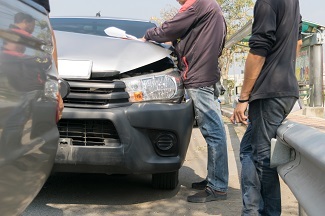 The key to keeping it together after a car accident is to prepare before the accident occurs. Start by assembling an accident kit for your car that you keep in your trunk. Include basic medical supplies, pen and paper, disposable camera and medical alert cards for any family members with allergies or other medical conditions. Stay calm. Check the condition of your passengers before you do anything else. Call 911 Immediately if you or anyone else in your car is injured. Get out of harm’s way. If damage to you vehicle is minor and you can do so safely, move your car and stay out of traffic. Turn your hazard lights on to warn other drivers. Exit your vehicle safely and check on the drivers and passengers in other vehicles for injuries. Call the police even if the accident is minor and there are no injuries. Don’t leave until they arrive. Be polite to the police and report only the facts of what happened. Take pictures, if it’s safe to do so, of damage to all vehicles involved and the accident scene. Ask witnesses to the accident for their names, phone numbers and addresses. If your vehicle is being towed, remove all valuables or other personal items. Seek medical attention as soon as possible if you were injured, even if you think your injuries are minor. Be sure to report all symptoms and areas of your body affected in the crash. Write notes to maintain a record of everything about the accident including weather, time, location, statements made, etc. Contact your insurance agent, even if you were not at fault. If needed, revisit the accident scene for additional photos. Look for skid marks, crash debris, or anything else that seems important. Photograph your injuries if they are visible. The old adage “a picture is worth 1,000 words” applies. Inform your employer you’ve been in an accident, especially if your injuries prevent you from working. Photograph damage to your car and get written repair estimates. Obtain the police report as soon as it is available. If you are injured and/or there is extensive property damage. Before speaking or providing information to another person’s insurance adjustor. If anyone is pressuring you into a quick settlement. Before the time period allowed for filing a claim expires. Please feel free to call us directly at 800.256.1050 for your free car accident consultation.